You will earn 1,931 Reward Points. Earn 1 reward point for every 1 dollar spent. 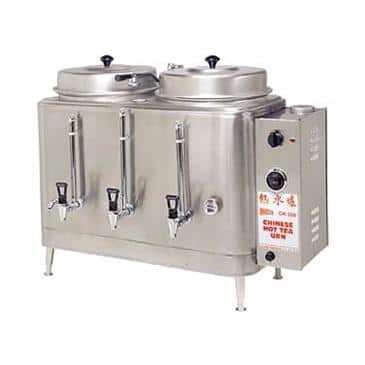 A kitchen must-have, your business will benefit from the handy Grindmaster-Cecilware CH100N Chinese Hot Tea Urn. This item is 28.50 inches tall and 17.50 inches deep. Full batch standard, half batch optional. New solid-state dual water level control. Relocated thermometer - easier to read. New modern look and user-friendly operation. New silicone fittings prevent corrosion, pitting, & leakage. Provides (2) brew cycle choices, full batch and half batch. Relocated thermostat sensor to side box for easy access and service. Easy changing of the water pump or thermostat - no need to empty urn completely.